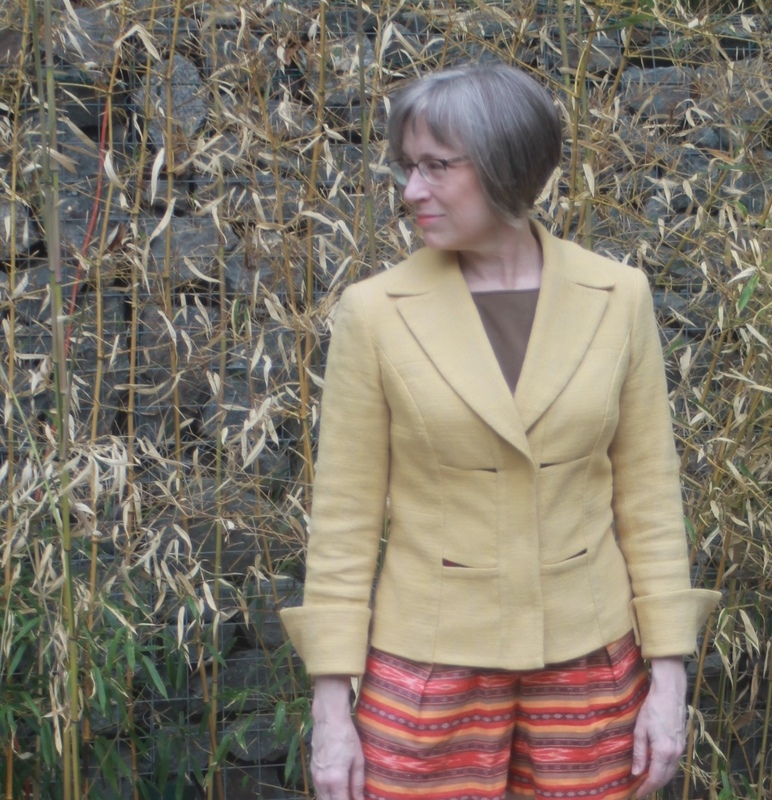 When I was searching for patterns for my vacation ensemble I decided it was a great opportunity to try a few Indie patterns. 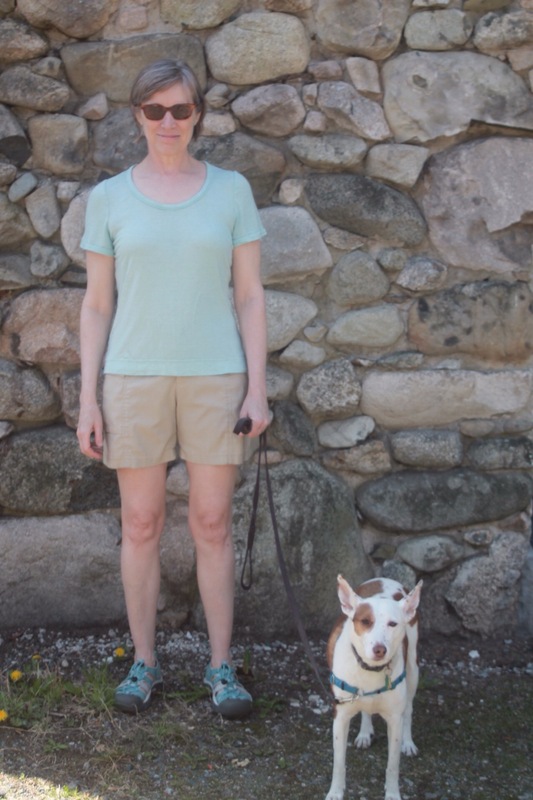 Many of the Indie patterns I see are dresses, which I don’t wear very often, and knit tops. I’m a jacket and pants kinda gal so most of them don’t appeal to me although I always need something to wear under the jackets. I thought I should at least try one or two Indie’s to see what all the fuss is about. I don’t think twice about downloading PDF’s and I pay little attention to instructions so my focus is on the details and the cut. I had a white scoop neck woven top listed in my SWAP queue and thought the Sorbetto might fit the bill. I had originally envisioned a “chemise” style in a loose weave to wear under jackets so I ordered a cotton/Lycra blend that turned out to be too stiff for a chemise style. Duh! In my pre-vacation delirium to make all things SUMMER I then decided that it would make a great Sorbetto. Not! I surged the side seams and used bias binding on the inside of the neck and armholes. Instead of a straight stitch I used a wing needle and a decorative stitch to stitch the binding down. This technique looks lovely on a linen but is quite muddy here. 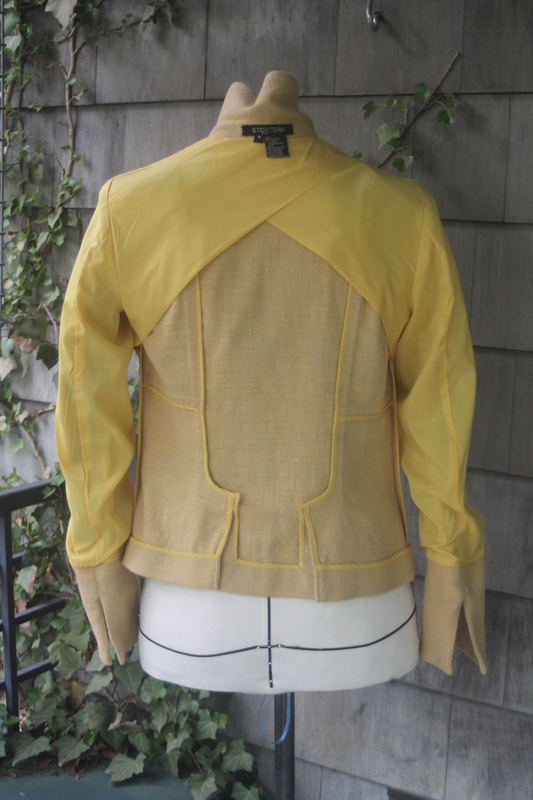 The pattern has no darts in back so there were gobs of fabric at the back waist all puffed out. I tried to tame it with some pleats but they look a bit snug in the photos. I’m giving this project a FAIL mostly due to the wrong fabric but also because I should just stick to my style of more fitted garments. I also want to change the shape of the neckline to something more square and perhaps add a center back seam that I can tweak. You live and you learn. Next up was Maria Denmark’s Day-to-Night Drape top. 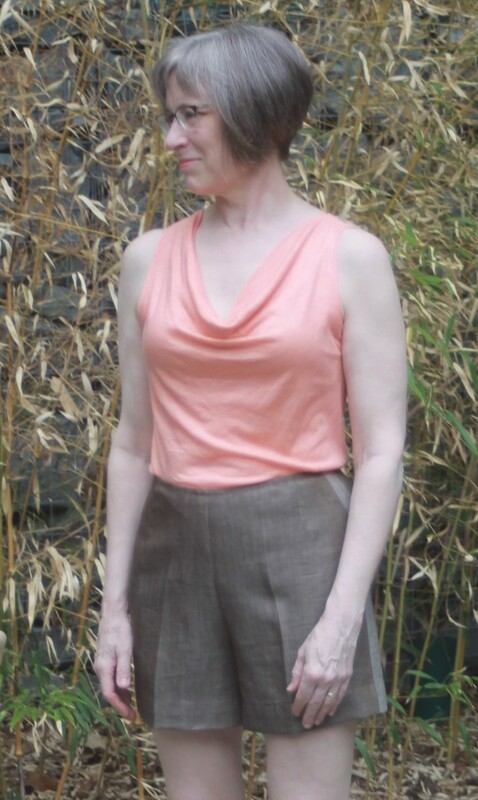 I had never tried a draped neckline but was smitten by Sew Busy Lizzy‘s awesome version. It’s a very simple pattern that gets its “cool” from the drape of the fabric. I had purchased a very thin sorbet colored cotton knit which feels luscious but really needs to be a bit heavier for this pattern. I tried it with a weight at the neckline but found it dragged it down a bit too much for me. This is more on the “night” end of the scale rather than “day”. I could see it in a more liquid-like material, a metallic, or sequins. There is also a lot of fabric pooled down the front below the bust which I suspect is inherent for a cowl neckline. Hmm…maybe I’ll try to marry this neckline to my sloper and have a two piece front. I’ll give this one a passing grade. Simple is not necessarily better. I need more fitted styles. This is not the same as tighter. Start relying on my sloper more. Pay more attention to the drape of the fabric. Both of these projects could have been better with different fabric. Check sloper to make sure their are no drag lines at the bust. These shorts were part of my St. Lucia vacation wardrobe. The fabric was leftover from a failed pair of pants. It’s a lovely fine twill weave of wool and silk in a warm brown with silver undertones. It looks sturdy but is actually rather delicate and doesn’t like to be stressed so we’ll see how long they last. 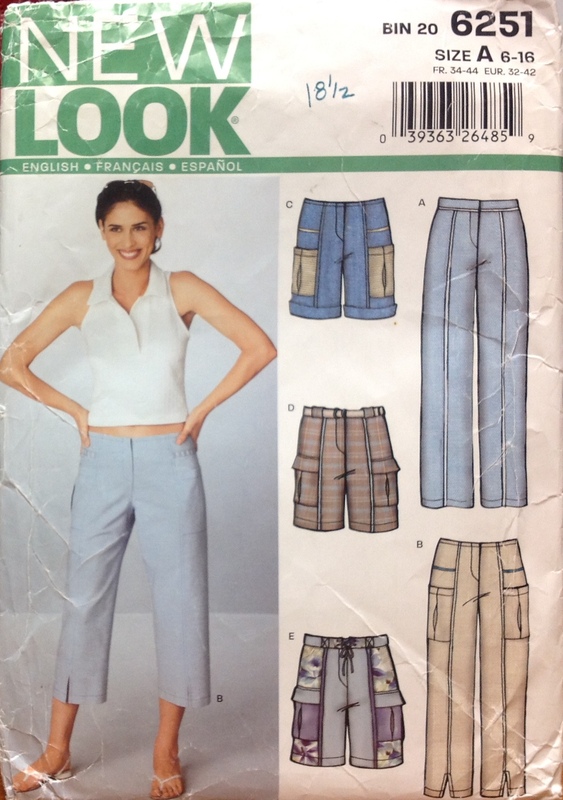 I downloaded this pattern (06/2013 #111A) because of its relaxed look, faced waist, and width. As designed the shorts have a side zip, faced waist, rear vent pocket, and rolled cuffs. They sit slightly below the waist. I omitted the useless and potentially lumpy back pocket and moved the zipper to the back. I also changed the bulky facing to seam binding and omitted the roll up hem. I laid the pattern out over my almost done pants sloper and found that the side seam sits towards the front. I know this is an optical trick to make one look slimmer from the front but wasn’t sure if or how to translate that to my sloper. Then somewhere along the way I lost an inch in width on each side! Must have been late at night. Hmmm….this is a design opportunity! I added a 1″ strip down each side using the back side of the fabric which is a grey/silver. It looks a bit crooked at the top but I won’t be wearing my shirt tucked in anyways. In the end I am quite pleased with the fit. I need to work out the bug with the stripe but I will be making these again. They definitely suit me! Take your time. Don’t sew under time pressure. 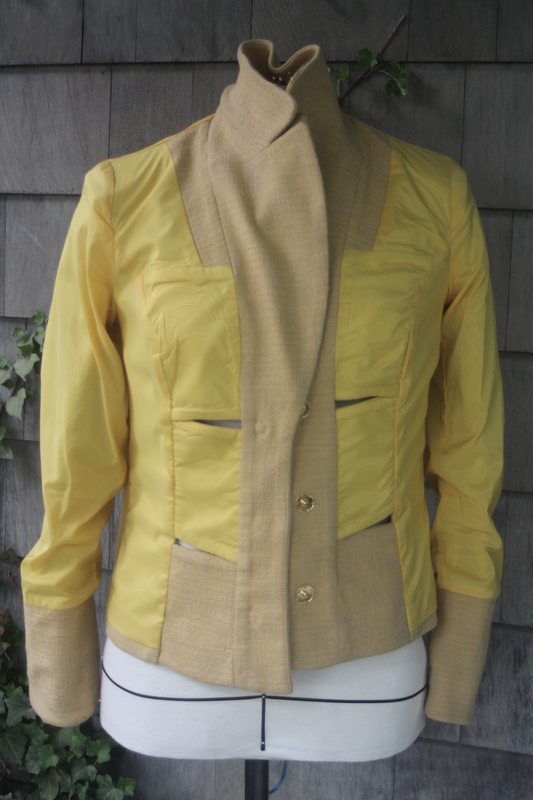 I found this jacket in a local second hand clothing store called Second Time Around in Needham. Basically the only time I shop for clothes these days is when I sneak in there after my haircut every seven weeks or so. I always have my eye out for unusual jackets. The back vents were still tacked together so I am assuming that it was never worn – although I can’t tell you how many men and women I see on my daily commute with the tacks still in place on skirts, jackets, and coats. This epidemic requires a public service announcement! But I digress. The brand, Etcetera, is one I had never seen before and it’s lovely. I have been fascinated by the construction and thought I would share it with you. The sleeves have deep vents faced with the fashion fabric so you can fold them up. It’s made of a heavy linen/cotton blend with a yellow and grey cross-weave. (The first photo is actually the truest color.) It’s got a little bit of pick stitching in there too. Will you look at these cut-outs in the front? The top, middle, and bottom sections of the mid-fronts are each lined and then stitched into the front and side panels. The sections even overlap at an angle. Brilliant! Let’s look at the inside. The front is lined and the back has bound seams. The configuration of the back stay is new to me. It has two overlapping triangular panels stitched into the shoulder and armhole of the lining. There is a small shoulder pad underneath. In theory this should allow for flexibility but in reality it’s quite constricting. Maybe the grainline is running in the wrong direction? I may actually remove the stays. Also the back vent is nicely mitered at the bottom. I want to try the cut-out idea. Now if only I had something to wear with it… I’m thinking grey or navy skinny pants. This is one of the Tees and shorts that I took with me to St. Lucia. 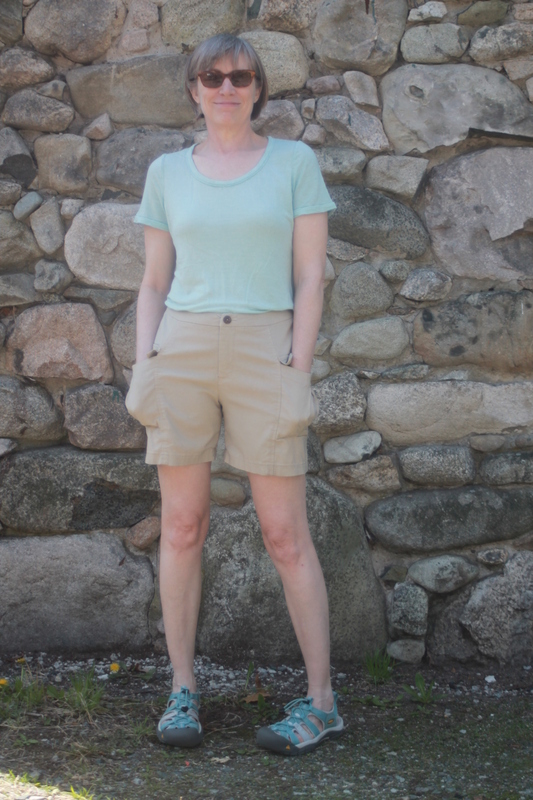 The top was made in January and the shorts, well, I thought I made them last summer but when I pulled out the pattern I saw they were made in 2011! It was actually in the 70’s yesterday so we took Olive for a special walk at the nearby agricultural high school. The shirt itself isn’t terribly exiting but I post it because it’s one step closer to a t-shirt sloper and I must say this is pretty darn close! I started with Jalie 2566 except used the shoulders and sleeves from my bodice sloper. The fabric is very light-weight cotton with a bit of a slubby texture. Construction was mostly done on the serger. 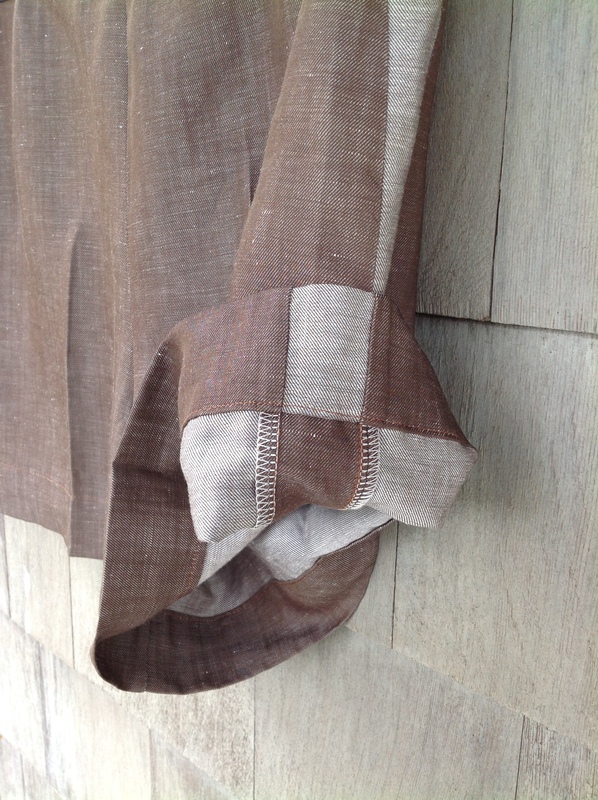 The sleeve hems have a band of matching fabric attached. The neckline has the same band except it’s stitched to the inside and then turned to the outside and stitched down covering the seam allowances. The hem was done with a coverstitch and I think that is the last time I will attempt it. GRRR! I have a 5 thread machine that can “convert” to do coverstitching, chainstitching, 5 thread safety stitch, etc. In theory it’s great, but in reality it takes 20 minutes to switch it over and back again. 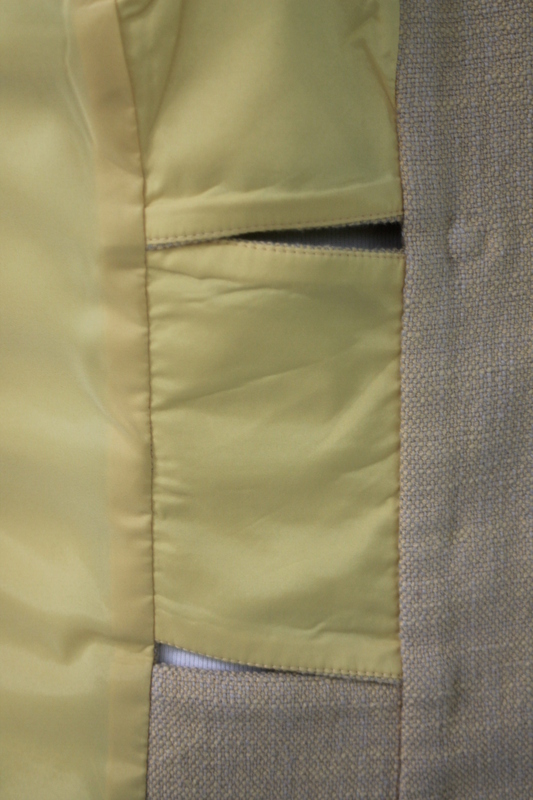 It also HATES to coverstitch over the thinnest tiniest of seams. Even a hump-jumper doesn’t help. In hind sight I should have bought a 4 thread serger and a separate coverstitch machine. Just to ease your fears, I would NEVER entertain the cropped version! The fabric is a super stretchy cotton/lycra weave with great recovery. The pockets work great for doggie bags! Since the waistband is a contoured band, I stabilized the top of the band with twill tape. It doesn’t work terribly well as the top of the band cuts into my waist. It’s just not very comfy. I want the waistband to move and stretch like the rest of the shorts but I have to add SOME structure to it so they don’t stretch too much. I figured if I added a bunch of interfacing to the waistband it would be too stiff. The fit is just OK. I made a number of modifications and they are still a bit short in the crotch and a bit snug at the waist, nothing I can’t fix if inclined to do so. In spite of their ‘short‘ comings these are the shorts I pull out most often on the weekend. I have been taking sewing lessons for the last few months and our number one priority has been a well fitted pant sloper. As of Saturday we. are. almost. there. and then it will be PANTS CITY around here! Once the sloper is in place I’ll try this pattern again. 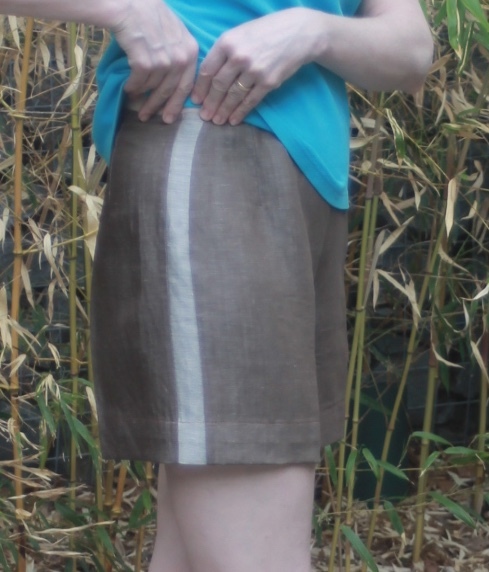 Don’t add twill tape to a waistband if the fabric has a lot of stretch. In a wash’n wear garment pocket flaps need fasteners.